Sending multiple emails within a company is made easy with the Email Builder Template. You can compose and save professional grade emails then send them to the employees of a business or to your closest friends and family, all with the click of a button. Whether you need to organize a power sales meeting for your small business or invite everyone you know and love to your upcoming wedding, this template has something for you. 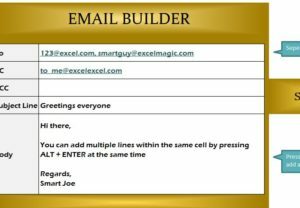 Using this free template is simple and easy, just enter to the group or list of people you want to send your message to and enter any of your own email addresses in the right space. From there, it’s all just a simple matter of taking the time to compose the perfect message you want to send out. The last step is just to click the giant “Send Email” button to send them all out. You can’t miss it! You will just need to follow a few simple steps in order to master this singe tab template. Read the set of instructions below to get started building your email. Make sure not to enter too many characters as excel will throw an error. This is due to the limitation of excel. The difficult task of sending out important information to a bunch of people becomes simple and easy with this free template. With only three steps, you can go from utter chaos into organizing your team or informing your friends and family about whatever you need. You can download this free template by clicking the link below.